It might only be the 9th edition of the race, but it has already made it into the hearts of the fans. 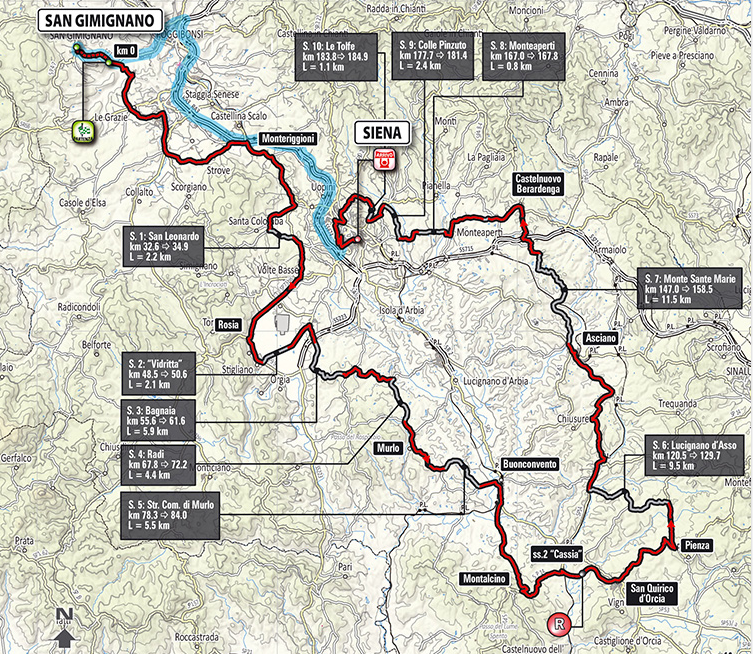 The race has 11 sections of “strade bianche” or white roads to you and me. These roads are made from gravel and are very dangerous. Ascents are very difficult as you have to stay in the saddle or face the chance of losing your back wheel. Descents are more dangerous. A tiny error could lead to you hitting the deck. That isn’t the best thing to do, as you risk leaving half your skin on the gravel. One word to describe the profile is lumpy! The route is full of short, steep climbs and fast descents. Add in the gravel roads and you can see why it has been increased to a World Tour race. The weather is to be kind, with a nice sunny day. That means we’ll get massive clouds of white smoke as the vehicles make life very hard for the riders. One tip to the riders is close your mouth and breath through your nose! The race finishes with a steep climb into Piaza del Campo. It reaches 16% and provides an exciting end to a brilliant race. The two longest sectors of white road are 6 and 7, at 9.5km and 11.5km, respectively. This is where we usually see the first selection of the favourites. Like cobbled races, good luck is essential. A puncture at the wrong time and your race is over. Positioning is also crucial, as we enter these sections. 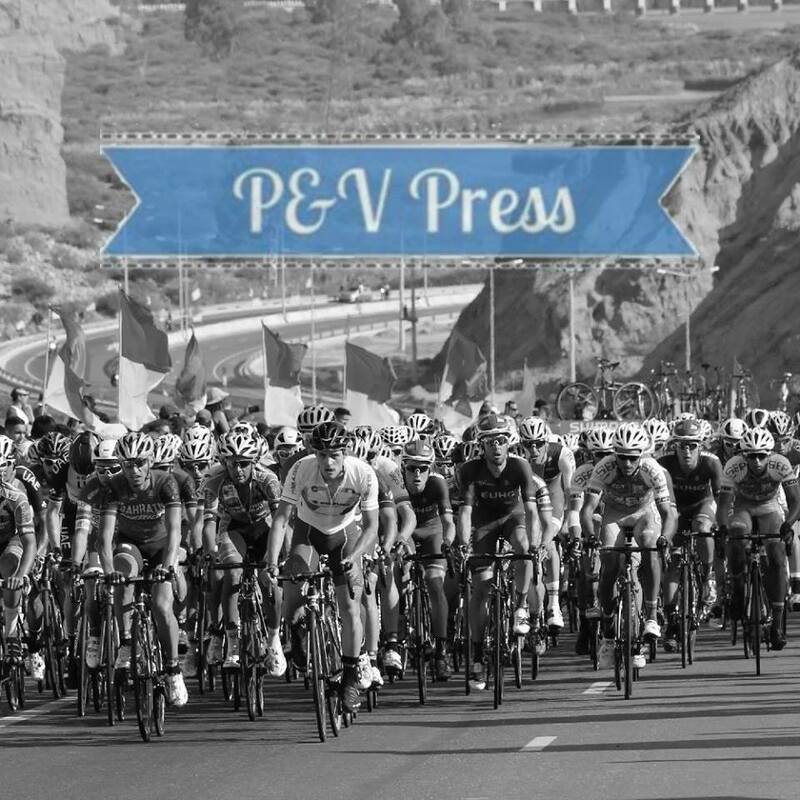 Expect a big fight for control of the peloton as the experienced riders know where they need to be, at the front! Fabian Cancellara is a two time winner of the race and he’s back. He possess two of the qualities that are essential to be successful here: good climbing and descending skills. A lack of teammates has cost him in the past, as he can’t mark all the attacks himself. Last year, when Sagan and Kwiatkowski attacked, Cancellara couldn’t follow. The Pole and Slovak rode away with 22km to go and never came back. No one can be sure when the decisive move will come and what type of finish we’ll get. You are just as likely to get a solo victory as a small sprint up the final climb. A strong move inside the final 22km is always likely to succeed as most teams will only have single riders left in the peloton and nobody wants to work. Moreno Moser did this in 2013, timing his attack perfectly. Cancellara does arrive with an in-form teammate in Fabio Felline. The Italian has already notched up 6, top 5 results this season. Not only that but his climbing seems to have taken a massive step forward over the winter. If he can stay with Cancellara, they both have a good chance of success. Felline could be sent up the road, allowing Cancellara to play the waiting game or vice versa. Peter Sagan is still looking for his first win of 2015. He has finished 2nd here on two occasions. He didn’t have the power to cope with Kwiatkowski, last year, and played the role of teammate when Moser won, the year before. This is a route that suits Sagan, thanks to his brilliant bike handling skills. He’ll have the strongest team of the race too, not often you can say that about him! Local boy Daniele Bennati is crucial as is Juul-Jensen, Kreuziger and Boaro. Tinkoff – Saxo are serious about this race and Sagan has to win soon, doesn’t he? Some teams arrive in incredible form. Both Etixx and Sky have enjoyed great starts to 2015 and will look to continue that here. Team Sky have Omloop winner, Ian Stannard here. The Englishman was active here in 2014, finishing 16th. As joint-leader, Sky have Peter Kennaugh. He left Andalucia with incredible form. Not only was he 6th on GC but was extremely active on stage 5, when Froome won. At the start of the stage, he tried to get in every break, before going on to do a great ride for Froome. He also is a fan of riding in Italy, having won stages in Giro del Trentino and Coppi e Bartali. Etixx have already enjoyed a great start to 2015, but it could have been better. They wasted winning positions in Omloop and Le Samyn. It seems that in every one day race, they dominate and have numbers in the finale, remember they also won the Cadel Evans race. Their team is missing some big names, like reigning champion Kwiatkowski, but they still have strength in depth. Terpstra, Brambilla, Serry, Stybar, Uran and Vermote will ensure numbers in the final 50km. At that point, we shall see who they send on the attack. Zdenek Stybar looked very strong, last weekend. His cyclo cross background means he’ll thrive in the conditions and I think they should turn to him. He’s in great form and his uphill kick is fast. If not Stybar, they will turn to Uran or Terpstra. Anyone who watched the racing in Belgium knows that Terpstra is in fine form. If you can ride on cobbles, you can ride on gravel. Don’t underestimate Terpstra! Simon Gerrans makes his delayed start to the season, in this race. He broke his collarbone, on the eve of the Aussie Championships and has recently been in South Africa, at altitude training. I think it’s a risky decision bringing him here. Yes, he’s a great bike handler but he’s going to be a touch nervous on the white roads. As it’s his season debut, I think we won’t see Gerrans winning but the course is well suited to his characteristics. BMC have Van Avermaet and Sami Sanchez. GVA raced well, last weekend, but the doping stories must be distracting him. If he can put them to the side, this race is great for him. Don’t expect too much from Sanchez, this is his second race of 2015. AG2R have 2 riders in good form: Nocentini and Montaguti. Both have been gaining in form and Montaguti finished 4th in Laigueglia and 3rd in Lugano. Despite that, Nocentini will be team leader. He knows this course well, finishing 3rd here in 2013. At 37, he won’t have too many chances left. 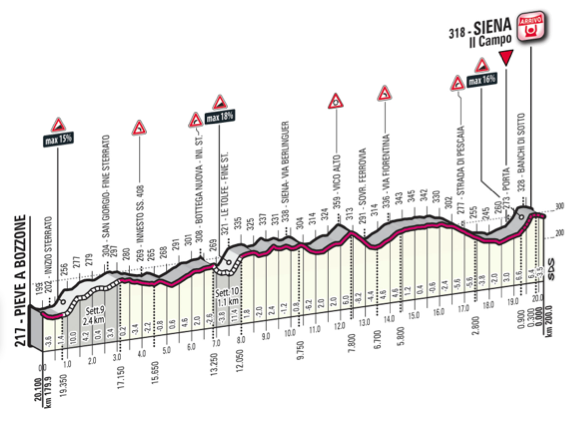 Lampre also have two cards to play in Pozzato and Niemiec. Pozzato has enjoyed a fine start to the season, his first for a while. He has started this race on two occasions but never finished. On form, he has a decent chance here. However, Niemiec looks like a better bet. He has been doing great work for the team, in Etruschi, Laigueglia and Lugano. He rode unselfishly to help his sprinters and now it’s his time. Niemiec is a very underrated rider and he appears to be enjoying the best years of his life. He was 10th here in 2013, so knows how to finish well. The Pole will be a big threat in this race. Movistar always seem to arrive here with 3 options: Valverde, Amador and Visconti. The big pick is Valverde. Again enjoying a good start to the year, he is a strong performer on these roads. What Valverde lacks is the reason he hasn’t won here, the ability to attack from distance. The Spaniard is not a fan of attacking from 20km and this is often required to win the race. Can the old man change his ways? I doubt it. Visconti and Amador are decent options but that’s about it. If we get a group of 10 at the finish, Valverde will have a great chance. Damiano Cunego is a regular top finisher here. Despite now riding for Nippo – Vini Fantini, he has started the season well. His best finish here was 3rd in 2011. Can you turn back the clock? The first selection of the race happens during sector 6 and then we have the main selection during sector 7. This is the longest and most difficult part of the course. After sector 7, the bunch is usually down to 25 riders. With 40km to go and some tough climbs still to come, it’s too early for the decisive move. At this point, the teams with numbers are in a great position. They are able to chase down any attacks but can also send riders up the road. Having teammates is very important to your chances of success. This is where Tinkoff, Etixx and Sky should have an advantage. In 2012, Cancellara made his move with 12km to go. This was on a steep, gravel climb. He crested with only 2 seconds of an advantage but he never came back. In 2013, Moser made the move with 17.5km. He benefited from being a teammate of Sagan. The bunch lacked numbers and coordination, so Moser won the race. Last year, Sagan and Kwiatkowski, made the move with 22km to go. They raced all the way to the finish, with the Pole taking the title. Moser returns, this year, with Cannondale-Garmin. He’s enjoyed a fine start to the season and will have Haas and Hesjedal here to help. He got a little lucky in 2013, he’ll find it hard to win this race again. Southeast have three options: Finetto, Ponzi and Favilli. I remember speaking to Finetto, after the race is 2014. He was devastated about his performance. He felt he was badly placed as we reached sector 6 and he never recovered. He hasn’t enjoyed a great start to the year and he’ll be desperate to put in a good performance. He’s an ex-mountainbiker, so is very at home on these roads. The Italians have only won this race once, not a great sign for Mauro and co! The Italian champion will be here! Vincenzo Nibali is not a regular here. He finished 15h in 2012 but with his focus lying later in the season, I don’t think he’ll win this race. Astana have another option in Lars Boom. A brilliant bike handler. this race looks good for him. He hasn’t raced since Qatar so I’m unsure what form he’ll have. I’m really excited to see Sep Vanmarcke here. He’s been here before, in 2013, but was a DNF. Will he be motivated for this race? If so, he’ll be a hard man to beat. I hope he goes “full gas”. The finish is brilliant, with sections of 16%. In 2011, a large bunch arrived together, with Gilbert taking the uphill sprint. With such a dramatic end, it’s a shame the race is often settled before it. Maybe this year will be different? As usual, sectors 6 and 7 will sort the peloton out. After this we’ll have a very small bunch of around 25 riders. 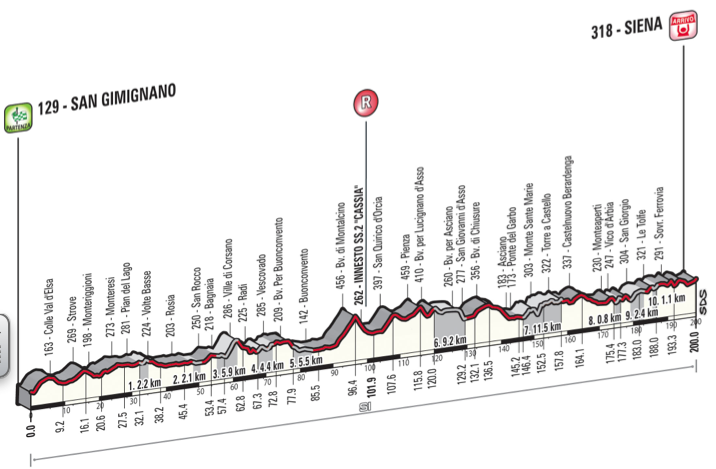 The crucial move will happen inside 25km to go. Both sectors 9 and 10 have 15% ramps, perfect for an attack, but the winning move could come anywhere inside the final 25km. Etixx will be well represented, so they have a decision to make. I think they go for Stybar. When he attacks, who goes with him? Peter Kennaugh is a rider who loves to attack and I see him as a better option here than Stannard. What will Sagan and Cancellara do? They’ve nullified each other before and the race has past them by. I don’t see that happening here, Sagan will make a move. With many riders already in form, this is a tough one to call. Again, I will stick with picking a rider from Etixx and go with Stybar. I was very impressed with him in Omloop and KBK, he looks in great form and the roads are made for him!